This is a guest post written by Eric Higgins. We’ve come a long way since the very first instances of verbal and written communication. From the early stages of speech, along with the primitive use of symbols and pictures to convey messages to one another, we’ve evolved into a communications powerhouse. Data has never been transferred faster and communication has thus never been more sophisticated than it is right now. From ancient writing techniques and newspapers we’ve moved on to text messaging and email. From Morse code and telegraphs to telephones and radios, we now moved on to televisions, computers and cell phones. TV’s that utilized tubes with vacuum seals and boasted analog signals and black and white color are now Flat Screen LCD’s or Plasma’s that boast all digital High Definition Signals, thousands of lines of resolution and millions of color pixels. Rotary phones and dial up communication has been transformed to portable phones. From there they moved on to satellite communication cellular phones. Hand written symbols, numbers and letters went from being carried to being digitally transferred. We no longer have to wait for days to receive information as most of our data messages can be transferred in a matter of seconds over high speed broadband internet connections with computers that boast Gigabytes of Ram and Gigahertz of processor speed. With all of the evolution that has taken place, with TV’s, phones, and computers, we wonder what is going to be the next best thing. Despite the popularity of all of these forms of communication individually, I can’t help but pick a technology that does all three. The technology that can host phone calls, transfer data, and hosts television broadcasts gets my vote. You may be thinking that your cell phone is where I’m headed with this. Granted, cell phones can transfer data (text messaging, email, web-browsing, etc), and they obviously allow you to make phone calls. Some of them do stream live video broadcasts. They are highly mobile too! I, however, want something that is better equipped for the challenge. Cell phones cannot process information as fast as a computer can send out emails or internet surf. They cannot produce the visual stimulation that a TV is capable of. So, although they can do all three, I’m not picking a super cell phone as the next best thing. This leaves me with my TV and my computer. I am not sure how you feel about this, but I don’t think I want my LCD TV to serve as my phone. For practical purposes, my TV is on my wall, in my living room. Two problems with this are that I would not be able to pick my TV up and move to another room to make a phone call if I wanted privacy and if you have people over watching a game I doubt they would want you to interrupt the game to take a call. If you know how annoying that phone number that pops up on your TV when you have Digital Phone service can be, then you know what I’m talking about. Process of elimination leaves the computer as the last tech standing. Computers are highly capable of data transfer. They can host live video broadcasts with exceptional quality. Now if we can just get them to host phone calls we’d be on to something. Oh wait, they already can! I know that making phone calls through your computer has been something you could do for a long time with a microphone and headphones/speakers. However, with the help of Voice over Internet Protocol (VoIP) phone technology it simply has not been easier. In addition, the development of ridiculously great laptops has pretty much made phone calling through your computer as mobile as your cell phone; sort of. An explanation is coming up soon. 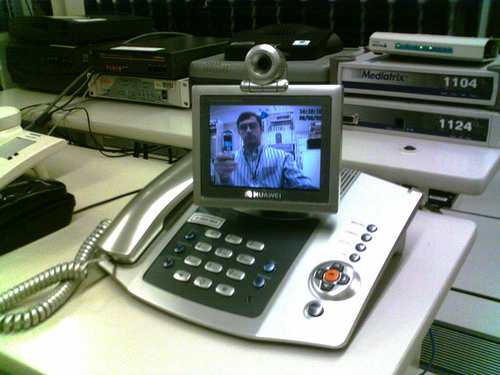 VoIP allows you to make phone calls in three different ways. You’ll need a high-speed broadband internet connection for all three options. First, you can still make that phone call through your computer using a microphone and headphones/speakers, or a headset that does both. Second, you can actually still use an old phone you have lying around your house to make an internet phone call with the help of a VoIP adapter that hooks up to a broadband connection. A third option, (mainly for businesses that have multiple incoming/outgoing calls) is to buy a special VoIP phone that is just like many other businesses phones but it plugs directly into a broadband connection. It has all sorts of special features right on the user interface so that you can easily answer and transfer calls multiple phone calls. Picking the option that best suits you depends on what your intended use is. The main component of all of these options, the backbone as so to speak, is the network. Without the network that connects all of us to one another, none of this is possible. Therefore, development of a network that is sophisticated enough to meet the demands of modern communication is a necessity. In addition, having all of the necessary networking products to stay connected to it is vital. After all that is said and done, I feel as though VoIP is a great leap in the communications technology field. Combined with the mobility of a laptop and you basically have the recipe for a mobile communications powerhouse. Right now wireless hotspots are limited. For this combination to really develop, wireless networking must develop. Until your laptop can get connected to the network and stay connected no matter where you go and what you do, you will not always have access to phone calls or your data transfer and television communication options. While you can usually wait to tune in to your favorite TV station or send out an email, you cannot always wait to make or receive an emergency phone call. Therefore, in most cases, VoIP and a laptop will always rank second to a cell phone for speech communication purposes. When that wireless network expands and can guarantee connectivity in more places I feel VoIP makes a name for itself in our society. After all, if you have a laptop already capable of high speed data transfer that can now allow you to make phone calls and watch TV; you probably will spend a lot less paying for all three services individually. Let’s look forward to network development and VoIP to take us into the future of communications technology. This article was written by Eric Higgins for CXtec. CXtec offers over 40,000 networking products. Some items include network adapters, networking cables, and VoIP communications technology such as adapters, gateways and new and used phones. The Geek Stuff welcomes your tips and guest articles. When does it ( network development ) is expected to happen ?? gr8 article! helped with my project …… thankz !!!! Thanks, I was looking for info like this for a Social Studies project. had to use this for my assignment. credited to you, of course. thanks!